Anyone who knows me understands how much of a staple Bloody Marys are in my drinking repertoire. Hell, it’s my basic nutrition when in Vegas. This whole blogging gig has done more than embarrass me at work; it has introduced me to a bunch of really interesting people scattered around the globe. Even more up my alley is that each has unique perspectives on food, cooking, culture, etc. Anyhoo, to avoid make a short story long, I made my famous Bloody Mannys since they fit her theme well, looked nice, and most importantly I was parched. So, without further ado, click here to see the Bloody Manny in its full glory. I didn’t blow it. Wow, I am feeling really good reading this post. Thank you. Your guest post was a success. I loved it, my readers loved it. You have a lot of talent, and your passion for everything food is reflected in your blog. You get a ribbing from work because they love it, they don’t always get it, but they love it. Again, thank you for taking the time to guest post. Thanks Monet, glad you stopped by and hope to see you around! Andy – Stella – you two make a good pair! What a great recipe, beautiful beautiful photos and the recipe is to die for… horseradish – and bacon vodka? ?/ Never heard of that – but I want some. I might just special order it. What is the label? We have Ceaser here. 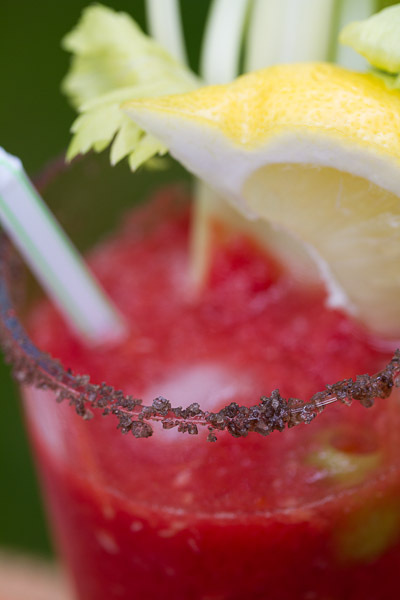 The Clamato juice is also a deadly combination with vodka… and the spices.